There are quite a few small independent pet food brands around offering quality natural foods for pets, and made by the same manufacturer who supplied the big well known brands, using similar ingredients and developed by their own nutritionists - and good value for money. They are worth taking a second look at particularly if you don't particularly want to pay £50 for a large bag of a well-known brand of natural pet food, but still want the quality of ingredients. 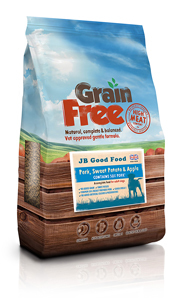 JB Petfood is a case in point with their 'Good Food' range of natural premium foods. Simple online sales and food delivered direct from the manufacturer, keeping transport costs to a minimum (very green). The Naturals range is very close to James Wellbeloved in formulation, but around £5 a bag cheaper. There's a Working Dog option on many of their products which will save you the VAT as well! The Recipes in the range foods offer named cereals and meats, alongside nutritional additives such as Omega-3 fatty acids and prebiotics, so they fit nicely into the 'Natural' category of premium foods. Expect to pay from £29 for a 12kg sack standard food up to £39.99 for the Grain Free, which is inexpensive for quality Grain Free food. Less/kg for the Working Dog offers on many of these recipes. 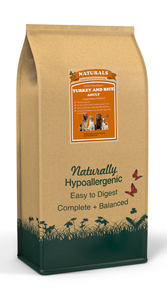 Rice, Turkey Meal, Oats, Freshly Prepared Turkey, Whole Linseed, Turkey Gravy, Turkey Fat, Beet Pulp, Alfalfa, Minerals, Vitamins, Natural Seaweed, Omega 3 Supplement, Chicory Extract, Calcium Carbonate, Yucca Extract, Dandelion, Vitamins and Minerals.